Going all the way back to some of the posts I’ve written about the very first Spider-Man comic I ever purchased (Amazing Spider-Man #296), I’ve alluded to the fact that one of the things that fascinated me as a kid about comics was the sequential numbering system of each series. It’s totally simplistic, and in many ways has been rendered moot in recent years thanks to the frequent rebooting/renumbering of legacy books like ASM (though maybe, just maybe, the “Make Mine Marvel” promotion later this year will go back to the “olden days” for us old farts). But once I put two and two together as a kid and “discovered” that this was how comics worked — that each issue was one key component in a regular, ongoing story that predated my existence by decades (and would continue to publish as such for decades to come), it was just another little unique wrinkle that made comics the hobby of choice for me. Baseball cards had a predetermined “set” of cards that were updated/upgraded every season, but they were not a serial medium like comics. And other collectibles like coins, stamps, etc. (which I admittedly never dabbled in) were their own animals entirely. So you can imagine what a big deal it was for me when a month after buying ASM #296, I saw ASM #297 on the spinner rack. I stupidly fell asleep at the wheel for the beginning of the Todd McFarlane-era in ASM #298-299, but did regularly pick the series up again at ASM #300, continuing for a few issues after that (until I inevitably became distracted by the usual array of things a 7/8 year-old like me would be distracted by). Regardless of the ways I initially willfully ignored my discovery, I eventually figured out the pattern: buy an issue of Amazing Spider-Man and a month later, you get the next and the next, and so on. I know a bunch of you out there are saying “well, duh, Mark!” but work with me here. This discovery would later serve me well in my quest in collecting every issue of Amazing Spider-Man because once I was able to ensure that I would never, ever, ever, miss another issue as it came out sequential (by subscribing to ASM via the mail, and today, via my local comic book shop pull list), collecting the rest of the series would just be a case of having to walk backwards through time and fill in the blanks. Which brings me to ASM #64. 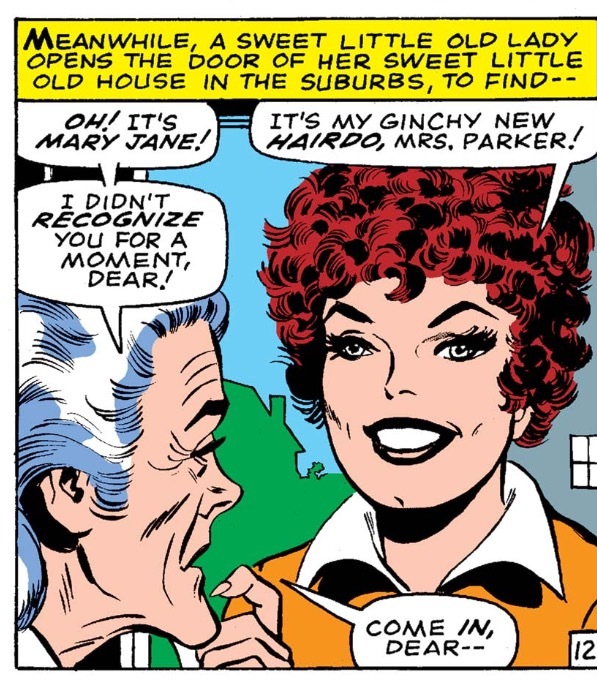 Published in 1968, ASM #64 came out 13 years before I was born. I obviously didn’t find it on any spinner rack while shopping in a candy store with a small amount of money burning a hole in my wallet. But my inevitable acquisition of it about a decade or so ago, did mark a milestone moment for me all the same as it relates to this idea of comics as a serial, collectible media. 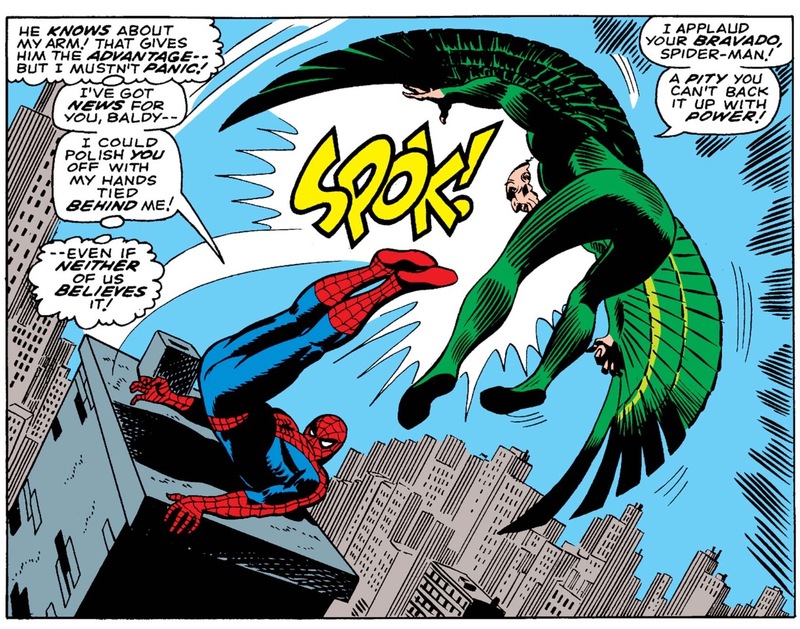 That’s because, as Chasing Amazing historians should note (all three of you), the very first Silver Age Spider-Man comic I ever purchased was Amazing Spider-Man #63, the first installment of a three-part Stan Lee/John Romita Sr. arc featuring everyone’s favorite old man with an attitude, Adrian Toomes, aka the Vulture. If memory serves, I picked up my copy of ASM #63 sometime around Christmas-time of 1994 when I was 13 years-old. As the story goes, after getting some money from relatives for the holidays (and what’s a better gift for a teenager from an aunt or uncle than cold hard cash? ), I went to a local comic book shop/dungeon and dumped all that moolah on the counter, demanding they sell me the oldest issue of Amazing Spider-Man they had (that I could afford). 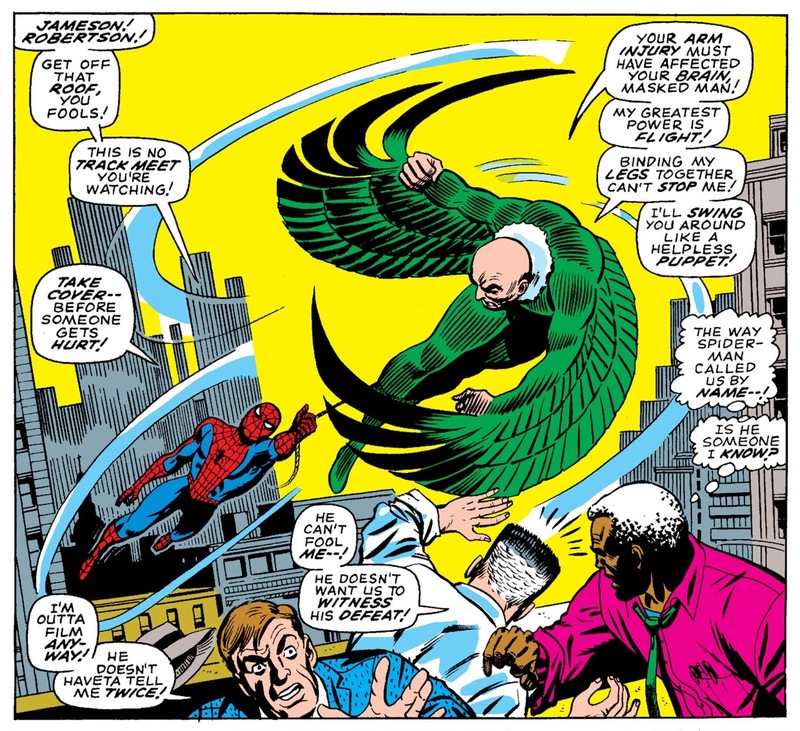 The befuddled clerk came back with his copy of ASM #63 (my first thought being, who’s the younger guy on the left in the Vulture costume flying next to the ACTUAL Vulture?) and the rest was history. In the years that followed, while my collection grew (and also had multiple fits and starts), tracking down a copy of ASM #64 was never exactly a priority. 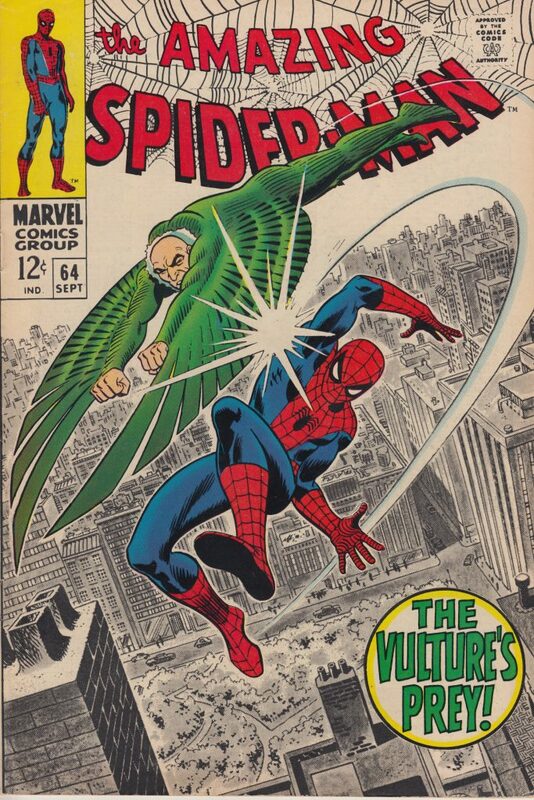 It’s a fun enough Vulture story that also features plenty of the usual Lee/Romita melodrama that makes the book read more like Archie than a superhero comic starring an angsty teenager as the titular character (subplots include: will Gwen Stacy ever forgive Peter for fighting with her brainwashed father, Captain George Stacy; how will the fragile Harry Osborn deal with his dad, Norman having a mental breakdown; and Mary Jane has a “ginchy” new hair-do). But as the chase narrowed down to the final 60 or 70 issues, I rotated through a number online retailers to track down those non “key” Silver Age issues. My priority at that point was pretty straightforward: if I found an affordable mid-grade copy of any of these issues, I would make the purchase sight unseen (so to speak, since I did check out the cover scans to make sure I wasn’t getting duped). In Chasing Amazing-speak, I often referred to these bulk purchases as my “monthly haul” as I set aside a specified chunk of my discretionary budget every month and attempted to buy as much as I could within those boundaries (kinda like my 13 year-old self, dropping 50 or 60 bucks on a comic book store counter and asking for the oldest comic I could afford). For the TL/DR version of this story, ASM #64 obviously found its way into one of these monthly hauls. And once I organized it by storing it in its proper short box, I realized that more than 15 years after the fact, I finally had the appropriate sequential “match” to my original Silver Age issue of Amazing Spider-Man (please don’t ask me to recall if I also had a copy of ASM #65, aka the third-part of that story, at that point, because I just don’t remember. However, ASM #65 does have a pretty distinct cover — and doesn’t feature the Vulture on it — so there’s a good chance I owned it but because I didn’t immediately associate it as part of the Vulture arc, having the sentiment of having the “complete set” didn’t register). Having this comic in my collection demonstrated one of the very first lessons I learned as a regular comic book reader: that Amazing Spider-Man was a sequentially evolving story even going back to the very beginning (or in this case, 6 years after the beginning). The only place for me to go to find out what else happened in Spider-Man’s biography, was the issues I was missing that were published before ASM #63. I am starting my own Chasing Amazing at the age of 15. Only 30 issues but maybe someday!